Some people are lucky enough to recall memories of growing up with dogs by their sides, others remember pleading with parents and jumping through hoops to show they're mature enough to care for another being. Yet sometimes fate intervenes and without any prior planning, or pleading, you find yourself the owner of a pet, which is how Josh, the main character in Joe Friedman's new book The Secret Dog, begins. Aimed at children aged 7-9 years old the book tells the story of Josh, who moves to a remote island to live with his uncle following the death of his mother. He rescues a sheepdog puppy from drowning, and, in order to keep her, he trains her for the annual ‘gathering’ of the sheep. Joe Friedman has been a city boy all his life. A psychotherapist who was born in Chicago and now lives in London, his experience of working dogs has been non-existent. So when Joe decided to write a children’s book about a boy who rescues a Border Collie puppy and decides to train him to be a sheep dog, he knew he had some serious research to do. Almost all of the main characters have been inspired by people I got to know or heard about on Skye – Yvonne, the vet, Calum, for all example – and my affection for the real people is present in how the characters have been written. Josh is more of an invention, but one very much based on my experience with patients who have been traumatised by the loss of their mother early in their lives. It was a late night conversation in Skye, between the old Skye vet, Neil Stephenson, and my friend Joe, that gave me the idea for a boy who was inspired by a vet to take care of small injured animals on the common. The book developed from this. There is much about the book I love, but the moments I find most emotionally satisfying are those in which Josh makes an emotional connection with people – Yvonne, his mum, and the final big scene with Calum, where he really begins to grow up. I’ve had several dogs over the course of my life, and I’ve been able to train them to ‘sit’ on command, and (generally) to avoid running into the street, but no one would claim I was a great dog trainer. My current dog, a Golden Retriever came from Battersea Dogs Home almost ten years ago. He barks at people and then continues barking at the place they were after they walk away. He is also a terror during picnic season – if he sees one before we do, he’s haring off to eat as much as he can before we can catch up, so we have to keep him on a lead. Learning new dog training methods was a lot of fun, from reading books to visiting different trainers, I learnt a whole new world, not just for me, but Josh also. Here's one of our favourite extracts from Chapter 1 of The Secret Dog. Josh had been exploring the commons for five years, since he’d come to live on the island. He loved it all, every neglected bit of it. The sea eagle had adjusted its flight path again. It was flying lower, and circling an area near the river below. If there was an animal to save, Josh hoped it wasn’t on the other side. He hadn’t changed out of his school uniform. To his left there was a wire fence. He put his hand on a solid-looking fence-post and used it to vault over. Then he started down the steep slope, keeping an eye on the huge bird. It was circling still lower. Maybe it sensed Josh was a threat to its dinner. As Josh got closer to the river, he looked from side to side, his eyes rapidly scanning the area for any signs of life. His long, dirty-blond hair flopped over his eyes. He hadn’t noticed any breaks in the fence . . . And surely he’d see a sheep in trouble. The sea eagle must be homing in on something smaller. The river level wasn’t at its highest point – the winter snow from the top of the hills had already melted and passed through, but it was still flowing pretty rapidly. He hastened along the bank. The eagle was still circling. What was it looking at? Then Josh saw a slight movement, under a bush on the other side of the river where the bank was lowest. He couldn’t see what was making the bush move. But if it was just the wind, a sea eagle wouldn’t be so interested. He glanced at his school shoes and trousers. Why did it have to be on the other side? But then, out of the corner of his eye, he saw the sea eagle climb. Josh knew what that meant. It was getting ready to strike. Without thinking, Josh charged into the river. The icy water made him catch his breath. It filled his shoes and soaked his trousers but he didn’t hesitate. He knew he only had seconds to save the sea eagle’s prey. His right foot slipped on one of the slick stones at the bottom of the river and he started to lose his balance. But he managed to plant his left on some gravel and kept going. The sea eagle started to dive. Josh was out of time. He lunged forward. He tripped on the low bank but his momentum carried him into the bush. Thorns tore at his face. He was dimly aware of the sea eagle veering off, making a series of short, frustrated yaps. And then he saw what the bird was after. It was a little bundle of soaking fur. A hedgehog? No. His eyes widened. It was a puppy! 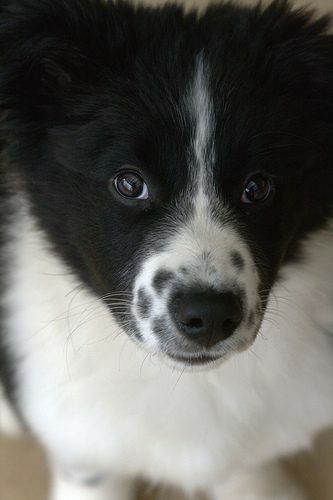 A black and white Border collie, shivering with cold. ‘Did you fall in the river?’ Josh wondered aloud. Then he understood: puppies this small didn’t stray far from their mothers, who didn’t go near rivers. He hadn’t fallen. Someone must have thrown the dog into the river to get rid of it. ‘I bet you were the runt of the litter,’ he spoke softly, knowing his voice would calm the dog. He imagined the puppy pulling himself onto the bank with a huge effort for something so tiny. Josh’s heart went out to him. ‘You’re a brave little soul,’ he said. Gently, he put his hand underneath the dog. He gasped. ‘You’re like a bag of frozen peas! You must have been in the water for ages! I’ll have to get you warm. Right away.’ Then Josh realised the puppy wasn’t a “he”. It was a “she”! Carefully, he crawled backwards out of the bush, trying to limit the damage to his face and clothing. Holding the puppy in both hands, he crossed the river. Once he was safely on the other side, he cradled her in one hand, lifted his sweater and started to undo the middle buttons of his shirt. She nuzzled up against his chest. Her nose was icy! He’d saved many animals, but never one that was this far gone. Surely he couldn’t have found her too late! His mind raced. If she was going to survive, he had to get her dry and then some warm food in her tummy. He glanced at his watch. His uncle, Calum, wouldn’t be home yet, surely. He’d be out doing something on their small farm. That would give him a chance to hide the puppy, and to get his trousers in the washing machine and his shoes in the airing cupboard. Still holding the sodden collie against his skin, Josh buttoned up his shirt as far as he could. He turned and, squelching with every step, raced towards home. Born in Chicago, Joe Friedman has lived in London for many years, where he divides his time between writing and practising psychotherapy. He is author of the children’s series Boobela and Worm, and in his spare time loves to do improvisation and story-telling.